Centennial Trail in Arlington, Snohomish County. Washington Bikes works effectively for state investments in biking and walking, from improvements to neighborhood streets to trail projects. We achieved record levels of funding for biking/walking projects in the 2013 biennial budget and a new all-time high in the 2015 biennial transportation budget, capital budget, and transportation revenue package. As a result of our work, people can bike and walk more safely and more comfortably in more places, all around the state. This list by region shows some of the results of our work over the course of 2013-2014 around the state. Projects funded are from the 2013 biennial budget; we fought hard and worked with our legislative champions to reach a new high in total funding for bicycle and pedestrian projects in Washington state. This page will be updated with the 2015 budget information summer 2015. We also work with local leaders across the state. Here we list some of our connections with local advocates and communities for program and policy work around the state. Note on counties listed in each region: We essentially follow the WSDOT regional divisions, although in some cases a county may appear in more than one WSDOT region and we list it in only one place below. The Quincy Valley K-7 path, Brewster’s Ferry Street safety improvements, Okanagan and Red Apple Road pedestrian enhancements in Wenatchee, the Susie Stephens Trail Phase 2 in Winthrop, Rocky Reach Trail connection to Wenatchee’s Apple Capital Loop Trail extension, and Omak Complete Streets project. Working with Local Leaders So That Washington Bikes—Our mapping of USBR10 took us to meetings with transportation planners and officials in Okanogan County. We met with a number of local advocates in Wenatchee, supported their efforts to turn people out on behalf of the bike master plan update, and talked with the publisher and editor of the Wenatchee World about the economic value of bicycling—a message that showed up in their editorials in support of the plan. We also worked with WSDOT to get extra “bikes on road” signage for the 2013 Redspoke ride over Hwy. 2 to improve event safety. We rallied people from throughout the region to testify on behalf of bicycling and walking investments at the Senate Transportation Listening Session held in Wenatchee Sept. 23, 2013. 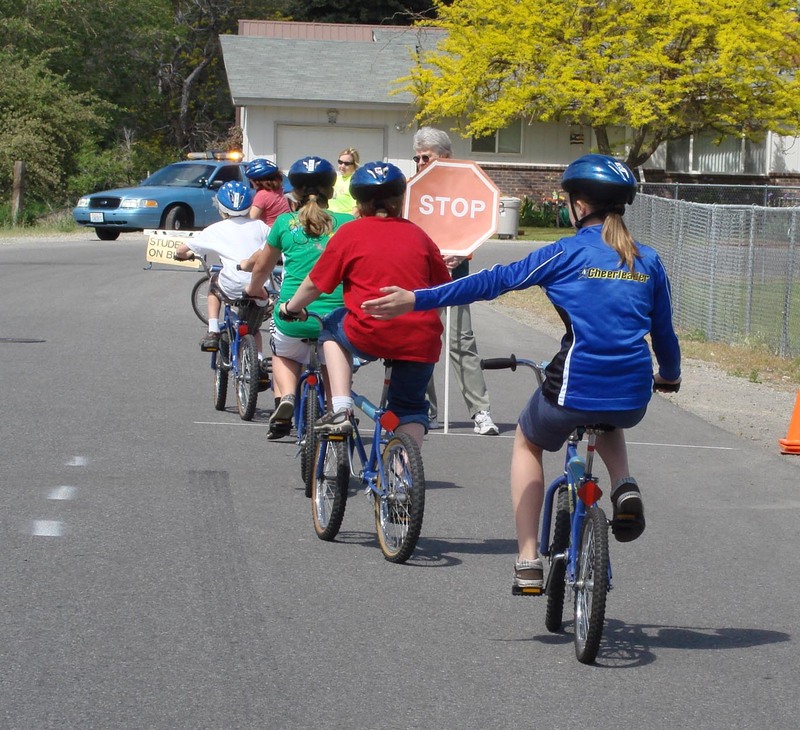 Washington Bikes to Your Schools—Around 2,300 middle-school students learned to ride with confidence thanks to our Safe Routes to School curriculum in Brewster, Bridgeport, Moses Lake, Omak, Pateros, Quincy, and Wahluke school districts. Bike Walk Mount Vernon; Carl Cozier Safe Routes project in Bellingham; Hawthorne Elementary Safe Routes and downtown streetscape in Everett; a Swinomish to La Conner Safe Routes project; SR9 pedestrian/bike improvements in Sedro-Woolley; Safe Routes project and the Guemes Channel Trail in Anacortes; 15th St. SW, 238th St SW, SR 104, and Madron Elementary Walkway projects in Edmonds; Jim Kaemingk Sr. Trail Extension in Lynden; Cedarhome Elementary Safe Routes project in Stanwood; and Centennial Trail intersection improvements in Snohomish. Working with Local Leaders So That Washington Bikes—We met with Skagit County bike and transportation leaders about USBR10; supported the Anacortes application for Bicycle-Friendly Community status (congratulations on Bronze! ); worked with Friends of the Guemes Channel Trail and Anacortes Parks Foundation to put together an event in Anacortes with Cong. Rick Larsen and State Rep. Kris Lytton; and began discussions with Snohomish County leaders about better promotion of the great bike travel/tourism opportunities. We rallied people from throughout the region to testify on behalf of bicycling and walking investments at the Senate Transportation Listening Sessions held in Everett Sept. 18 and in Bellingham Oct. 15, 2013. Washington Bikes to Your Schools—Around 3,100 middle-school students learned to ride with confidence thanks to our curriculum in the Anacortes, Lynden, Mount Vernon, Oak Harbor, Sedro-Woolley, and South Whidbey school districts. Safe Walking Route project in Woodland, safety improvements in Battleground, Sacajawea Elementary safety improvements in Clark County, Endeavour Elementary Pathway in Vancouver, and Jemtegaard Trail improvements in Washougal. Working with Local Leaders So That Washington Bikes—We shared a booth at Vancouver’s first-ever Sunday Streets Alive event with Bike Clark County; met with leaders of the Bicycle-Pedestrian Advisory Committee, Bike Clark County, and others to talk about how we can help grow bicycling and expand Safe Routes to School work; organized an event with legislators and local elected officials in Vancouver to highlight the need to complete the Lower River Loop Trail; and we’re providing technical assistance in Cowlitz County with the goal of implementing the Neighborhood Safe Streets Bill we got passed this year for a “20 Is Plenty” approach. We rallied people from throughout the region to testify on behalf of bicycling and walking investments at the Senate Transportation Listening Session held in Vancouver Oct. 7. Washington Bikes to Your Schools—Around 1,200 middle-school students learned to ride with confidence thanks to our curriculum in the Castle Rock, Goldendale, Vancouver, and White Salmon school districts. Improvements around the West Valley Middle School in Yakima and a sidewalk project in Ellensburg. Working with Local Leaders So That Washington Bikes—We met with over two dozen bike advocates in Yakima; worked with 3 Rivers Bicycle Coalition in Tri-Cities so the National Bike Challenge included the local Bike to Work Week efforts, and attended the wrap-up celebration at Howard Amon Park in Richland; supported an application by the Yakima River Canyon Scenic Byway coalition to begin plans for a trail from Ellensburg to Yakima; and promoted the annual Ann Weatherill Classic in Walla Walla. We rallied people from throughout the region to testify on behalf of bicycling and walking investments at the Senate Transportation Listening Sessions held in Yakima Sept. 24 and Pasco Sept. 26. Washington Bikes to Your Schools—Around 1,000 middle-school students learned to ride with confidence thanks to our curriculum in the Kiona-Benton, Pomeroy, Prescott, Waitsburg, and Zillah school districts. Safe Routes projects in University Place, Evergreen Elementary Safe Routes project in Shelton, improvements around schools in Puyallup, a sidewalk connector in Bremerton, the Foothills Trail Extension in Wilkeson, pedestrian/bike safety improvements on SR99 in Fife, Complete Streets project in Quilcene, nonmotorized improvements on Olympic Drive in Bainbridge Island, a sidewalk project in Olympia, Seabrook Trail, and Point Defiance Missing Link in Tacoma. Working with Local Leaders So That Washington Bikes—We met with leaders from North Kitsap Trails Association, West Sound Cycling Club, and Squeaky Wheels in Poulsbo; celebrated with Port Townsend in May 2013 as they kicked off the “Step On It!” campaign to get kids on the move; dug into the details of stormwater regulations and what they mean for bike lanes and paved shoulders in Kitsap County; met with local bike leaders and Sen. Christine Rolfes about a roundabout design at the Agate Pass Bridge on Bainbridge Island; and attended the Interagency Bike to Work Picnic in Olympia. We rallied people from throughout the region to testify on behalf of bicycling and walking investments at the Senate Transportation Listening Session held in Tacoma Oct. 9. Washington Bikes to Your Schools—Around 2,000 middle-school students learned to ride with confidence thanks to our curriculum in the Bainbridge Island, Eatonville, Port Angeles, and Port Townsend school districts. We also brought an adult bike program to Olympic College and Pierce College to inspire new riders in a new way. Safe Routes projects around Westview and Hamblen Elementary Schools in Spokane, nonmotorized improvements in Newport on SR2, and the Spokane River Centennial Trail Northwest Extension. Working with Local Leaders So That Washington Bikes—We met with leaders in Pullman about the potential for a rails-to-trails project between Colfax and Pullman; landed a grant that means we’ll be working with PE teachers in 2014 in Ferry, Pend Oreille, and Stevens Counties to get kids walking and rolling; connected with leaders in Colville and Newport about the future USBR10; and worked with advocates in Spokane concerned about the elimination of the city’s bike/pedestrian coordinator position. We rallied people from throughout the region to testify on behalf of bicycling and walking investments at the Senate Transportation Listening Session held in Spokane Valley Oct. 2 and your legislators heard you loud and clear. Kids from Broadway Elementary in the Spokane Valley practicing our Safe Routes to School bicycle/pedestrian safety curriculum. Washington Bikes to Your Schools—Around 2,600 middle-school students learned to ride with confidence thanks to our curriculum in the Cheney, Creston, Medical Lake, Northport, Reardan-Edwall, Tekoa, and West Valley school districts. 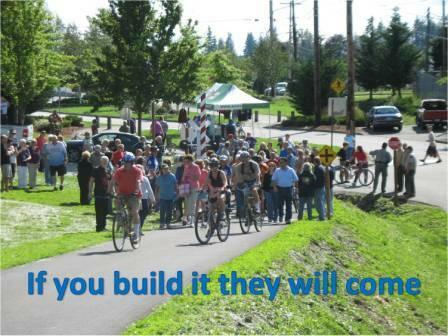 Redmond Central Connector; Puget Sound Bikeshare launch; Delridge multimodal path in Seattle; pedestrian/bike improvements in Snoqualmie’s Town Center; Interurban Trail/Burke-Gilman connectors in Shoreline; Safe Routes projects in Seattle, Tukwila, Federal Way, and Shoreline; West Lake Sammamish Parkway sidewalk connection in Bellevue; sidewalk improvements on NE 178th in Lake Forest Park; Cross-Kirkland Corridor as part of the larger Eastside Rail Corridor project; Kent Interurban Trail connector; and East Lake Sammamish Trail-North Sammamish development. Working with Local Leaders So That Washington Bikes—We welcomed new executive director Elizabeth Kiker at Cascade Bicycle Club and are working closely with them on a number of issues and projects; convened a meeting with the executive director of the Green Lane Project to help move Seattle’s application forward in the next round (and it was successful! ); attended the celebration of funding for the Cross-Kirkland Corridor; and put together a panel of pro-bike local business and citizen interests to present to the Transportation Commission in Everett. We rallied people from throughout the region to testify on behalf of bicycling and walking investments at the Senate Transportation Listening Sessions held in Bellevue Sept. 17 and Seattle Oct. 14. Washington Bikes and Walks to Your Schools—Our advocacy for Safe Routes to School project funding builds better, safer facilities around your schools (see list above). We also brought an adult bike program to North Seattle Community College and Bellevue Community College to inspire new riders in a new way.